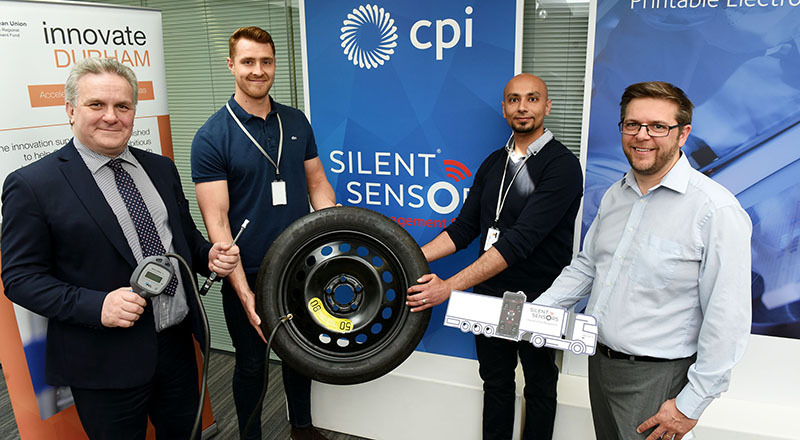 Innovate Durham, which is led by Teesside University, is helping Silent Sensors to grow skillsets in its business as it develops its innovative tyre management system. The company, which is based at Netpark in Sedgefield, specialises in products and services using RFID (radio-frequency identification) tags, sensors, energy harvesting and data delivery. Knowledge Exchange Internships are part-funded by the European Regional Development Fund. They bring together a talented graduate with a university specialist or industry expert to work directly on company projects to help deliver new or improved products or processes. It is fantastic that academic expertise from Teesside University has helped the company to develop this new product which promises to have enormous benefits for the transport industry. Marcus Taylor, CEO of Silent Sensors, said: 'We have two very talented electronic engineers working with us. 'They identified a gap in software development skills. Working with Tyrone on this helped us really develop those skills. Innovate Durham project manager Suhail Aslam said: 'We are delighted to have been able to provide support to Silent Sensors for this very innovative project.